Sam Pethokoukis of the Siena Saints sends a high-velocity serve over the net, looking for a hole in the Bobcats’ back line. 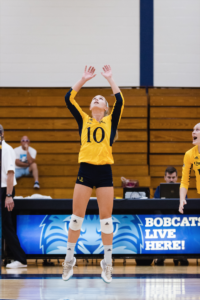 Quinnipiac junior hitter Kat Miller quickly drops to her knees to settle the sinking line drive and bumps an arching ball towards the Bobcats front line, where sophomore setter Maria Pansari awaits. Pansari has a couple options with the Bobcats’ second hit, as sophomore hitters Kaleigh Oates and Natalie Alechko are crashing towards the net, eager to drop the hammer and give the Bobcats another point. Their anticipation is overwhelming. They have been playing alongside Pansari for over a year now, and have seen her set a perfectly-placed ball over 2,000 times. Pansari faces toward Oates as the ball descends to her waiting hands, but elects to direct her set backwards to Alechko. The ball that blazed over the net just seconds ago has been gently calmed by Pansari before taking off downwards once again. Alechko leaps, rears back and drives the ball into the Saints’ front line, who are only able to get a hand on it before it redirects harmlessly out of bounds. Point Bobcats. Assist to Pansari. There is nothing monumental to the conversion. It’s only the first set of a regular season match late in September, and has extended a comfortable Bobcats lead to 20-12 as they make their way towards an expected victory over a Saints team that had yet to claim a set all year. Everything about the Bobcats’ point seems overwhelmingly routine. But don’t tell that to Pansari. As her teammates crowd together to celebrate their most recent triumph, Pansari soaks in the seemingly mundane moment. Chills and goosebumps flood her 5-foot-6 body. Her hair rises. 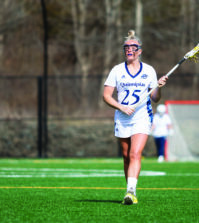 Sure, her recent assist may not carry the same magnitude as the 43 she dished out in the team’s MAAC semifinals win over Marist last season, or the 2,000 career assists she reached in Sunday’s match against those same Red Foxes. If you ask Pansari, they all feel the same, regardless of time and place. It is a feeling Pansari has now been overcome with over 2,000 times in her young career. After shattering the single season Division I program record last year with 1,358 helpers, Pansari finds herself celebrating another major milestone. Does assist number 2,000 induce a heavier set of chills than a set in a regular season rout against Siena? “No, surprisingly not.” Pansari responds. For as self-aware and emotional she is when watching her set give her team a point, Pansari is heedless to her march toward history. She wasn’t aware of reaching the 1,000 assists milestone last season, until long after the match was over. She had no idea she was heading into the weekend just 57 assists away from reaching 2,000 until she sat down to interview for this article. “I didn’t know I was that close until you just told me,” Pansari admits. The chills Pansari feels with every successful set suggests she isn’t negligent to personal success. She just keeps her keen eye on what’s most important. Pansari may not be worried about overflowing the stat sheet, but her teammates that benefit from her sets make sure her contributions aren’t overlooked. The recognition from her teammates helps Pansari shed the “unsung hero” stigma that often comes with being a setter. Much of the attention is paid to the hitters who smack down a thunderous kill and ignite the crowd, but the front line of the Bobcats never overlook Pansari’s contribution. Quinnipiac head coach Kris Czaplinski, a former setter at the University of New Haven, is also appreciative of Pansari’s staggering success. 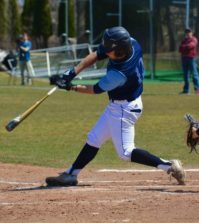 Czaplinski’s background in the position has caused him to take Pansari under his wing, and the sixth-year head coach marvels at his personal project. 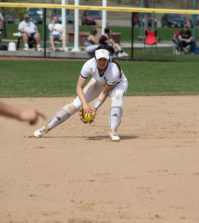 The Quinnipiac Division I record for assists is 3,431, held by 2011 graduate Kayla Lawler. The all-time record regardless of division is 4,519, claimed by 1999 graduate Jen McClain. Pansari is already the third player all-time, and the second at the Division I level to reach that mark, with over two seasons left to play. Her peers have seen enough to know a run at the school record is a legitimate possibility. Given Pansari’s trajectory in the eyes of Czaplinski, he also has reason to believe there is some history in Pansari’s future. While she appreciates the sentiments, Pansari echoes her coach and doesn’t like talking about records. She wants to leave a legacy that cannot be written in a record book or stitched on a banner hanging above Burt Kahn Court. Whether Pansari will make a serious run at the record or not is a conversation for another day. Like she says, the record doesn’t really matter. For Pansari, number 4,520 would be just as exhilarating as the thousands that preceded it.